SOUTH YARMOUTH, Mass. – The annual Cape Cod Baseball League All-Star Game heightens the mid-summer baseball fever and brings together baseball fanatics, families, and top college coaches to watch the Cape Cod Baseball League All-Stars shine. Father-son bonds are born, dreams are unveiled, and crowds unite as one. But through the throngs of enthusiastic fans slip casually dressed individuals who aren’t necessarily there to cheer on their favorite Cape League team. Were it not for their radar guns and clipboards, they would be undetectable to the average fan. But this is Major League Baseball’s first look at its upcoming crop. These are the ones who work diligently behind the scenes in order to position their teams to capture the top prospect. 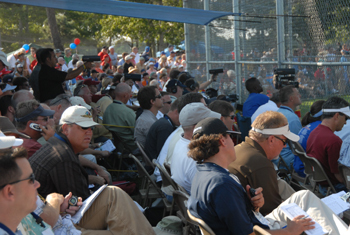 This is the life of the major league scout. Orr, a veteran in the world of Major League scouting, has been in the business for years, and has moved around the country. He began his career as a scout for the Florida Marlins after he graduated from University of Florida and remained there for four-and-a-half years. Leaving his home state, he traveled north to the world of Red Sox fanatics and worked three years for Boston. Currently with the Tigers, he is closing in on his third full year with Detroit. At the All-Star Game last week, he was asked if there were any Cape Cod Baseball League alumni in the majors whom he personally scouted. Over the years, Orr has had an excessive amount of luck with the Cape League because it is the best collegiate summer league in the country. He believes that “the league this year is very deep in talent.” The abundance of top players is certainly widespread, but that doesn’t increase the scout’s chances of landing a top prospect. Behind home plate at the All-Star Game this year at the home of the Y-D Red Sox also sat clean-shaven and impeccably dressed Mike Roberts. If any scout is a veteran, Roberts would by far win first place. In baseball today, it is rare that an individual stays for a prolonged period of time with one organization, whether a player or someone who works behind the scenes. But Roberts has remained with the St. Louis Cardinals for 29 years. With his clipboard on his lap and his stopwatch in his hand, Roberts tracks the amount of time it takes for the catcher to throw to second base, and the pitcher to throw to the catcher. Every aspect of the game is covered by the scouts. However, most players at the All-Star game were not having an off-day. Clemson Tiger Brad Chalk, who represents the Falmouth Commodores this summer, was named MVP of the West Division by the scouts after going 2-for-4 with a stolen base and a walk while providing some solid defense in center field. And it doesn’t look like Roberts is going anywhere anytime soon. During the off-season, he plans on meeting with families and friends of the players that their club had drafted in June in order to build a personal history with them. And then even more travel is expected as he, along with all of the other Major League scouts, gears up for yet another MLB draft, which seems to creep up on them a little too soon each year. As the All-Star Game winds down, the scouts quietly close their notebooks, pack up their radar guns, and depart from Red Wilson Field. While the fans continue to enjoy the summer afternoon, perhaps hitting the beach again after the game, these scouts take off to a different diamond, some miles away, with the hope of spotting a new astounding player who very well could be a star tomorrow.